It has been quite a day. 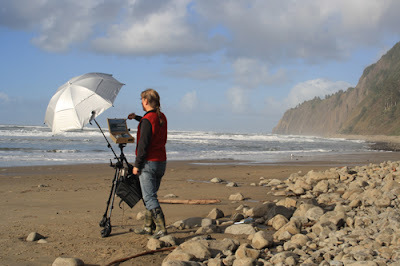 The sun came out and I actually felt warm enough to shed a few layers while painting on the beach this morning. The drawback to the sun coming out is that there are more people wandering around the beach which means folks are likely to want to come up and chat. I had a hard time concentrating with the interruptions. I spent the past two days getting caught up on chores and prepared for the next round of ten paintings. The weather was a bit stormy so it worked out well since the sun came out today. 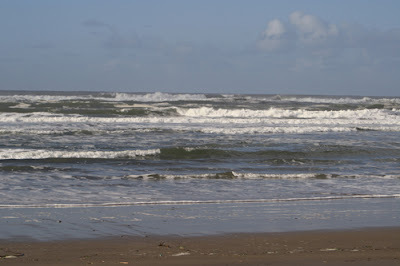 The ocean was a lovely shade of dark green with the mostly blue sky reflecting off the water. For today's painting, I did my best to concentrate on values, in spite of the interruptions. The picture of the painting above was taken at twilight which meant I had to use the daylight bulbs. The painting was wet and the canvas buckling a bit on the panel so there is a bit of a glare on the wet paint. I simply tape the edges of the canvas to the panel which is not ideal and causes bucking. These are reference and practice sketches only. They get removed from the boards to pin up on the bulletin board. The paintings that I will be selling will be on nice linen canvas boards. Of course, the angle is different and the lens does not get the close up perspective I can get from life. Notice how dull and flat it looks? This is why I don't use photos for reference at this point. They can have their place though. So pick a wave, any wave. The need to keep size, perspective, and interest means I edit, heavily, when designing a composition. 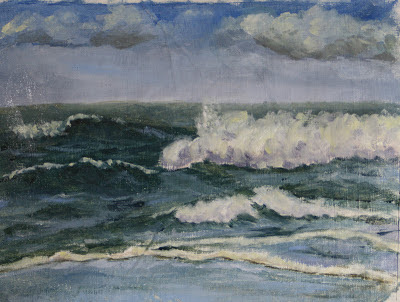 I do sketch it out in my notebook first after studying what the waves are doing that day. The light and tides had changed quite a bit by the time I took this picture and the clouds over the ocean at this point were not as dramatic. Looking south was a completely different story. I could see a dark curtain of rain sweeping in from the sea. I managed to beat it home. The boots I am wearing are my old ones and yes, my feet are wet. As I mentioned earlier, it was warm enough to shed some layers. When I got home and picked up the mail, my new boots had arrived. I get to try them out possibly tomorrow if I don't need to paint from the truck. So much to learn. Good thing I am planning to paint 100 sketches to start with. I am going to need all the practice I can get. I have a final coat or two of gesso to put on the remaining small hemp canvases and then I can work on finished paintings and drawing practice in the afternoons. I am having a hard time staying awake so I best finish up. I love your photo! Its like a painting itself, and its a great view of you in your natural milieu! How beautiful. 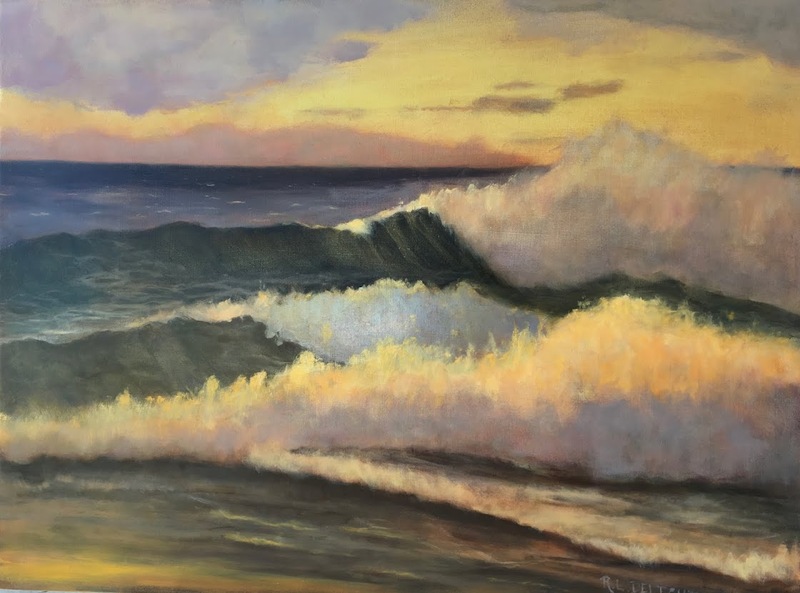 Your wave paintings are so interesting and beautiful too. You always undertake your projects with such discipline. I can only stand in awe. The picture does look flat compared to the wave study, but there is some interest going on between land and sea. I love how sand picks up the water reflection where it is newly wet and often times try to figure out is the wave coming in or receding. I would imagine it is very hard to capture that.I love the picture of the painter painting. I always think they are so insightful and when done as actual paintings interesting to see what the painter feels is important to convey when putting themselves to canvas. The wave study has some nice differences from the past 10. The sea looks very deep in motion and color depth in this one. High tide maybe? Are you happy with the clouds? Hope the new boots keep you good and snug! Thanks for the lovely comments. I am glad you two enjoyed seeing the pictures as well. I do want to occasionally include photos as the area is so beautiful. The camera never does the scene justice though. Theresa, the day was sunny which changes the light and color so dramatically here. I am starting to pay a bit more attention to tones now. Of course, when you add a new element of learning the others slide back for a time. The boots are working well!